CMHC - Fall 2015 Rental Market Reports - REMAX River City - Commercial | Edmonton, AB. REMAX River City – Commercial | Edmonton, AB. If you would like to know what these mean in terms of your apartment building property value in Alberta, be sure to contact us. In the primary rental market, the apartment vacancy rate in the Edmonton CMA increased to 4.2 per cent in October 2015 from 1.7 per cent in October 2014. The average rent for a two-bedroom apartment in new and existing structures was $1,259 per month in October 2015. 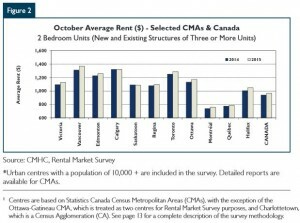 In rental structures common to both the October 2014 and 2015 surveys, the year-over-year change in the average rent for a two-bedroom apartment was 2.2 per cent. 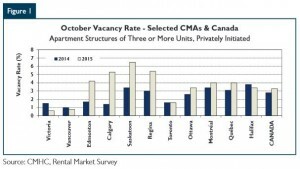 In the primary purpose-built rental housing market, the average rental apartment vacancy rate in Canada’s 35 largest centres 1 increased to 3.3 per cent in October 2015, from 2.8 per cent in October 2014. As a result, the vacancy rate stands at its highest level since 1998. The increase in the average vacancy rate across Canada’s 35 major centres was due to an increase in the supply of purpose-built rental units, combined with reduced demand as a result of lower immigration to Canada and weaker employment prospects for younger Canadians. The oil-producing centres of Alberta and Saskatchewan saw the largest increases in vacancy rates, reflecting the negative impact of lower oil prices on net migration and employment conditions in these provinces. Overall, the average rent 2 for two-bedroom apartments in structures common to both the 2014 and 2015 surveys rose by 2.9 per cent. Developments in the secondary rental market were consistent with the primary rental market. Vacancy rates for condominium apartments in Vancouver and Victoria stood below 1.0 per cent, while reaching highs of 5.3 per cent and 4.9 per cent in Edmonton and Calgary, respectively. The average monthly rents for two-bedroom condominium apartments in October 2015 ranged from a low of $1,065 in the Québec CMA to a high of $1,754 in Toronto.